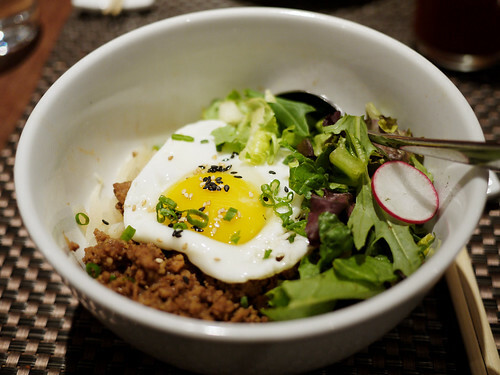 In brief: Don't go here if you're an Asian food purist. And if you do go here, don't order the salad unless they happen to have changed the disturbingly sweet vinaigrette dressing. Except for the disturbingly dessert sweet vinaigrette on the salad, the $9.95 lunch special bi bam bap at Mira Sushi is pretty enjoyable. It tastes like your Westerner roommate made it with whatever fresh vegetables she had in the refrigerator. The slight sprinkling of seaweed and marinated meats brings it back to Asia, but the red pepper, chunky cucumber and shredded lettuce is too much of this continent. Following the change from its previous owners, Mira Sushi seems to be doing well and I'm sure it's going on the too lazy to walk too far list.